Waveblaster compatible synth module based on the SAM2695 chip. Excellent for gaming, music production, sound experiments,..
Combines wavetable and FM synth sound for a high end retro sound. 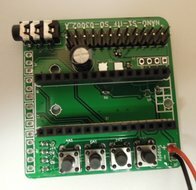 SAM2695 MIDI specifications and chip datasheet : click here. 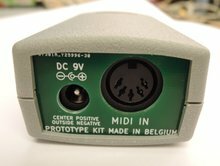 Cheap but brilliant replacement for the more and more becoming less available GM-daughterboards like famous Roland SCB-7 or Yamaha DB50XG. Compatible with any soundcard that has a Waveblaster connector : SoundBlaster 16, Audician 32, ESS AudioDrive, Aureal Vortex 2 and many others. Please note: There are some older soundcards with a Waveblaster compatible header but don‘t have an MPU401 interface. Instead there is only the SoundBlaster MIDI standard supported so the games that run with the S2 module are limited. You can use SoftMPU to emulate the MPU401 interface in this case. Visit http://bjt42.github.io/softmpu/ for further information and a list of compatible games.